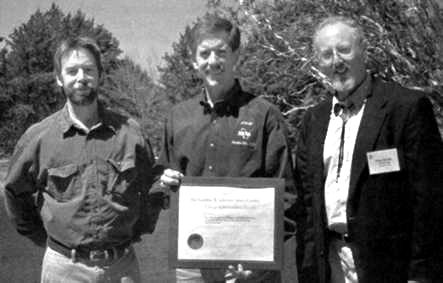 Astronaut Jim Reilly, center, presents a JSC Group Achievment Award to Paul Bauer, left, assistant director for the New Mexico Bureau of Geology and Mineral Resources, and Peter Scholle, Emeritus Director of the Bureau. 0ne of the many training activities provided to each new class of astronaut candidates (ASCANs) is a geology field trip to northern New Mexico. The instructor for these field trips is Dr. William Muehlberger, professor emeritus, University of Texas Department of Geological Sciences. Dr. Muehlberger has been training the astronaut corps in geology since the Apollo days. In addition to geology training, the most recent ASCAN class, the Penguins, also participated in a geophysical exercise, which was a simulation for a Mars landing site investigation. This exercise was developed in collaboration with the New Mexico Bureau of Geology and Mineral Resources and the New Mexico Institute of Mining and Technology by Dr. Patricia Dickerson, a Lockheed Martin geoscientist at JSC; Dr. Paul Bauer, assistant director and senior geologist for the Bureau; and Dr. Muehlberger. "All the critical elements coalesced for this first field geophysical sim for planetary exploration: a need to assess the local water resources, well-defined scientific objectives, thoroughly professional project leaders from NMBGMR and NMIT, motivated and perceptive explorers, and supportive center, directorate, and contractor management. All were vital, " Dickerson stated, "but Paul and his coworkers assured our success." The objectives of the exercise were to begin building an exploration experience base within NASA and to start training the astronaut corps in geophysical methods appropriate for exploring Mars. Astronauts John Young and Jim Reilly participated in one of the field exercises to help validate the simulations. The ASCANs used global positioning system equipment, laser-ranging devices, and gravity meters to collect gravity data to define buried faults as part of an ongoing groundwater investigation. The data acquired by the class were processed and incorporated into a groundwater database for the Taos basin and the state of New Mexico. The fact that this survey provided real data which addressed a pressing societal problem, in addition to providing valuable training, held strong appeal for the ASCAN group. The buried fault that the ASCANs helped locate and map will appear on the maps of the New Mexico Bureau of Geology and Mineral Resources as Penguino Fault. The data gathered will be published, with acknowledgment of the Penguins' contributions, as a scientific report by the Bureau, as well as in their science news publication. On April 7, astronaut Jim Reilly presented a JSC Group Achievement Award to Dr. Bauer to recognize the contributions of the geoscientists at the Bureau of Geology and at New Mexico Tech for their contributions in making this exercise an outstanding success. Peter Scholle, Director of the Bureau of Geology (now Emeritus), sent a letter to JSC saying, "Thanks to all the folks at NASA for taking the time, energy, and expense to recognize this achievement."